I've just returned from a wellness retreat called Soul Camp, which I affectionately refer to as a "hippie camp that allows the chance of alternative thinking and meeting alternative visionaries". Soul Camp is extremely difficult to describe because it brings together sessions you would be hard pressed to discover via your local Eventbrite listing. Sessions titled "Clear your chakras-free your life", "Practical spirituality: a discussion on modern mysticism" and "Breathing for manifestation" are offered in a hideaway camp off the grind and with limited cell usage. If reading those made you scrunch your brows and whisper "wtf" under your breath then you have a slight idea as to my same reaction. In the past I was never one to engage in mysticism and pseudoscience if you will and even now I'm not sure where I fall on the spectrum. However, within the last two years I've slowly been drawn to alternative thinking principles and practices. Perhaps this interest is from my life being completely shifted to mess and my need of balance encouraging me to welcome alternative ideas. But whatever the reason, things started slow, like a slow burn that gradually made it's way through the forest. It began with burning Palo Santo every night before bed as a way to calm and clear my head enough to sleep. I was going through a traumatic breakup of both love and friendship and falling asleep before 3am was a struggle. It then spread to clearing my apartment and energy with sage every couple of days then researching the idea of chakras, energy healing and most recently crystals. Despite it's current Instagram status as photogenic gold, crystals, at least for me, are still hard to understand. One of my clients told me a story where she had her apartment redone by a feng shui master and they had aligned crystals on her floor to encourage and attract "better men". Six months later she met her husband. Now of course the skepticism in me internally rolled my eyes and chalked it up to coincidence however I do believe in the law of attraction. Perhaps her Believing in these crystals is what ultimately led to her newfound openness and lead to the attraction of her future husband. There's a lot of rules with crystals I have yet to learn such as how to properly "clean" them, yes apparently you need to clean the negative energy out of them in order to maintain their healing properties. But one baby step that I found most conducive to my current lifestyle is incorporating them in my self-care routine. While I may not understand all their rules and intricacies, I enjoy my newfound interest and the research I've uncovered as a result. As previously mentioned, CBD and baths have become my new best friend and low and behold there's a way to blend the two AND crystals for a level-up experience. Read below on the benefits of bathing with crystals from Energy Muse and make sure you check out our shop for our new CBD + Crystal bath bombs. “Treat yourself” went from pop culture philosophy to marketing demand. It says a lot about the priorities of our culture that something as simple as “treat yourself” would take off the way it did. With so much influence put on work, and so little put on personal wellbeing, it only makes sense that a phrase, which advocates for giving back to yourself would strike such a chord with an over-worked population. Of course we should be investing in self-care! But as “treat yourself” permeated through pop culture and into marketing, it began to take a darker tone. It descended into a way to indulge poor decision making while feeling justified under the “treat yourself” banner. Self-care took a back seat to self-indulgence, and the investment into spiritual wellness was lost all together. It’s time to reclaim and redefine “treat yourself.” When we think of this philosophy from now on, let’s think about how we can treat ourselves in lasting ways, building self-care habits that are ongoing. This is less about justifying that third glass of wine, and more about finding ways to relieve stress and rejuvenate the mind and spirit so it will be more productive in the future. One way to treat yourself in a way that is both healthy and will make you feel like a king or queen, is to begin bathing with crystals. Bathing with crystals is the height of relaxation. It allows you to put yourself first, and set aside a moment of time that is exclusively about recharging your life force. If your work or relationship has you feeling overwhelmed, and the urge to spend a small fortune on a designer bag that you can’t afford is creeping in, take a moment. Pause the negative cycle that leads bad feelings to inspire bad decisions, and give yourself moment to unload. Sometimes something as intuitive as bathing with crystals to recharge is enough to satisfy that treat yourself need far more than a bag ever would. 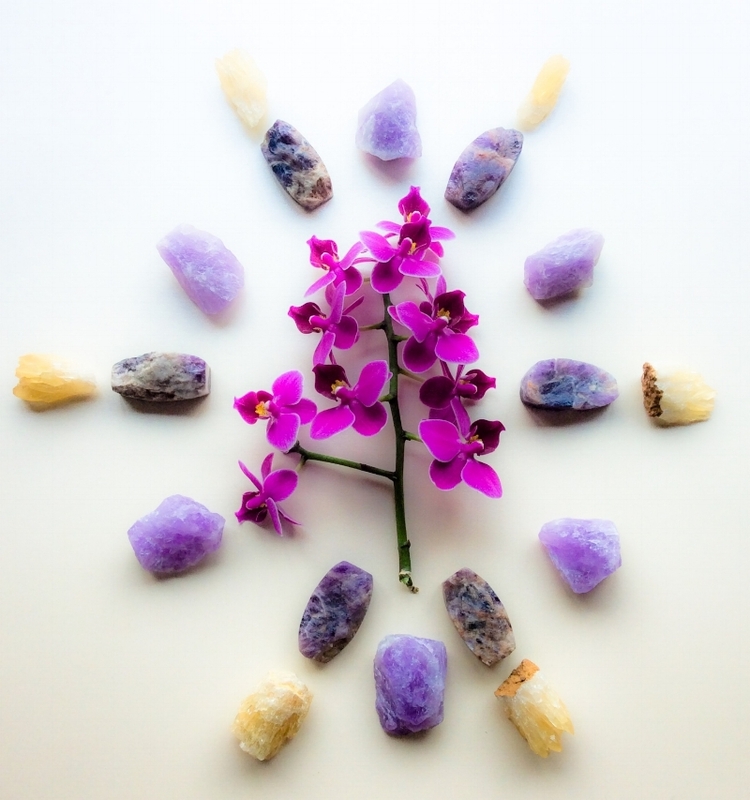 Amethyst crystals are wonderful to have during bathing relaxation because it is a natural stress reliever. It gives clarity and provides the basis for you to reach a deeper understanding of yourself. Let the amethyst dispel your negative thoughts by placing it at top of the bath by your head, so that it can connect with the crown chakra. Selenite crystals and quartz crystals work to replenish the energy that you have lost working. That feeling of being drained and wanting to buy a quick fix is linked to you need to stimulate a high that you can interpret as energy. Selenite will clear abolish that negative energy, and clear quartz as it beams fresh energy into your crown chakra. Use the clear quartz to reactivate your sense of self that has been depleted. Make sure that you do not place your selenite in the water or get it too wet, as it will dissolve! Set a citrine stone by your solar plexus chakra, or upper abdomen. Citrine is a bright stone with a bright energy. It is a bringer of clarity, creativity and positivity. It will reenergize your self-esteem and aid in future manifestation. Hematite can be placed by the root chakra. This stone lends itself to a sense of calm and balance. It is reflective in essence, and beneficial for times of self-reflection. This stone is good for stress relief because it is grounding. When your thoughts are chaotic, hematite will recenter your sense of focus. As you lay in the bath, focus on breath, imaging yourself bringing in new and releasing the old. Visualize your mind as being one with the water. Establish a fluidity of thought and energy. Relax to the sight of candle light dancing on the water before you, and flickering against your sparkling crystals. Treat yourself.